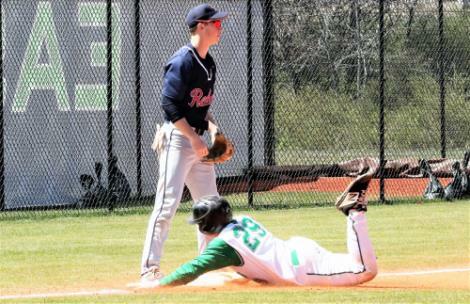 Ooltewah Invitational: Canes Edge Rebels, 7-6, For "Sweep"
East Hamilton catcher Will Campbell delivered a game-winning RBI single in the seventh inning to give the Hurricanes a 7-6 win over Franklin County on Saturday in the Ooltewah Invitational. 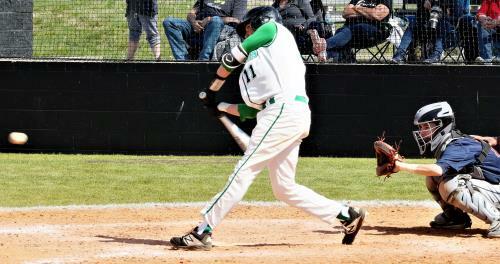 East Hamilton won four games over the weekend. In a ballgame that could have gone either way about four different times in seven innings, East Hamilton came up with the perfect scenario and had Will Campbell, the team’s Mr. Consistency for 3 ½ years, at the plate with one out and the bases loaded. Facing Franklin County reliever Isaiah Prince, Campbell took a first-pitch ball and then ripped a single into left field to drive home Blane Savage with the game-winning run to give the Hurricanes a 7-6 victory between potential region foes down the road. Savage started the seventh with a walk and moved to second on Josh Brown’s sacrifice bunt. Conner Thornburg walked and Jack Stone beat out an infield hit to load the bases. Campbell came through in the clutch. “Will is a steady guy,” Canes coach Steve Garland said. “I can’t say enough about him and I felt really good when he came up with the bases loaded. We had Will, who is our Mr. Consistency up. Then we had Bradley Garland (the coach’s nephew who transferred from Baylor prior to this school year) and then Pridmore up after Garland. As it turned out, East Hamilton needed need Garland and Pridmore and the added drama in its last at-bat. Campbell decided to end the game with his at-bat and give the team four wins in four Ooltewah Invitational games. Franklin County coach Mike Carter had a bad feeling as the bottom of the seventh played out. East Hamilton improved to 9-2 on the season and returns to District 5-3A play on Monday with a home-and-home series starting at Soddy-Daisy. Franklin County, which beat the Canes, 6-2, in last week’s Wildcat Classic at Hixson, fell to 6-4. East Hamilton has now won five straight games. The Rebels came out smoking with three first-inning runs off two bases-loaded walks and Gage Relford’s run-scoring single that trickled about 30 feet from home plate. East Hamilton answered with two runs in the bottom of the inning. Thornburg slapped an opposite-field single to left and Stone punched a hit through the left side ahead of Campbell being hit by a pitch to load the bases. Garland delivered his two-run single up the middle. East Hamilton grabbed the lead with a two-run third inning. With one out, Garland slammed a triple over center-fielder Blake Pickett’s head and the ball rolled to the fence. Garland went safely into third base with a head-first slide. He scored the game-tying run on Bracken Henson’s wild pitch. Moments later Pridmore hit a monster shot down the left-field foul and the ball hit about half way up the foul pole, giving East Hamilton a 4-3 lead. Another two-run inning, this one in the fourth, allowed the Canes to extend the lead to 6-3. Brown walked and stole second. Thornburg’s sacrifice bunt moved Brown to third and he scored when Stone reached on third baseman James Sells’ error. Stone later scored when Campbell singled up the middle. Franklin County rallied with two fifth-inning runs when Sells, who reached on third baseman Blake Hedrick’s error and wound up at second. Sells moved to third on Garrett Dayett’s hit and came home when second baseman Thornburg, drifting back into the outfield grass, caught Mike Stoltzfus’ pop-up while falling to the ground. The Rebels tied the game in the sixth when Gavin Hill, batting for Stuart Owens, singled and eventually scored on shortstop Savage’s throwing error to first base while trying to complete a double play. That set the game up for East Hamilton’s seventh-inning heroics. East Hamilton 7, Warren County 3: Bradley Garland (1-0) pitched the first four innings and gave up one hit and no runs while striking out four and walking three. Walker O’Rear went 2 for 3 and drove in three runs. Josh Brown also was 2 for 3 and Conner Thornburg had a hit and two RBIs. Ryland Holder had two hits in four at-bats with one RBI for the Pioneers. Brooks Helton had two RBIs. Bradley Central 9, Grissom 6: After spotting the Tigers, who are out of Huntsville, Alabama, two first-inning runs, the Bears put up six runs in their half of the inning and went on to post a 9-6 victory. Bradley scored on an error, Jake Thompson’s groundout, Eli Wilson’s base-loaded walk, a double by Logan Weeks and Freddy Johnson’s sacrifice fly in the opening inning. Grissom’s Zach Thomson belted a three-run triple in the sixth inning. The Bears’ Wilson hit a solo homer in the fourth inning. Tucker Still went 3 for 3 and scored twice for Bradley. Dylan Standifer had two hits, including a double, in four at-bats and Riley Black had a triple among his two hits. Michael Burger and Standifer provided Bradley’s pitcher. Burger got the win and Standifer picked up a save. Burger worked three innings and gave up seven hits, three runs and struck out four. Standifer threw four innings and allowed three hits and three runs. He fanned two. Bradley Central 4, Lincoln County 3: Spencer Lewis who came on in relief in the top of the seventh and recorded the final two outs, drew a bases-loaded walk in the bottom of the inning that produced a 4-3 Bradley Central victory over Lincoln County. Like East Hamilton, the Bears won all four of their games in the invitational. In the Bears’ seventh, Eli Wilson went down on a groundout and Caden Sherlin walked. Ryan Giovengo reached on an error by the right fielder and Sherlin wound up at third and Giovengo at second. Logan Weeks was intentionally walked. Lewis drew the bases-loaded walk and Sherlin scored the game-winning run. Giovengo, Bradley’s starting pitcher, gave up back-to-back singles to Miles Smith and Devin Gifford starting the Falcons’ seventh inning. Sammy Sharp flied out to center. Lewis came on to face Jackson Cothren and got a strikeout. He retired Ryan McAdams on a fly ball to center and go the victory with his walk in the bottom of the inning. McAdams had earlier hit a solo homer in the second inning and Cothren homered in the sixth. Giovengo threw 6 1/3 innings and was raked for 11 hits and three runs while fanning three and walking none. Dylan Standifer went 2 for 4 and scored once. Giovengo had two hits in four at-bats and drove in two runs. Soddy-Daisy 10, Warren County 7: The Trojans collected 15 hits, three by Noah Howard, off three Pioneers pitchers and put up seven runs in the first three innings. Jacob Jennings, Harrison Travis, Spencer Gore and Aaron Couch each had two hits for the Trojans. Gore and Couch had two RBIs apiece with Gore’s coming in a four-run first inning. Jennings and Gore each scored two runs. Noah Ferguson also drove in two runs with a third-inning single. Franklin County 9, Chattanooga Christian 5: The Chargers’ John Rhodes homered in the third and seventh innings, but the power display was not enough to offset a six-run first by the Rebels. In the second, Chase Rhoton started the scoring with a run-scoring single. Garrett Dayett’s fielder’s choice pushed Blake Pickett home. James Sells came across on a wild pitch. Tate Wallace was hit by a pitch with the bases loaded and Dayette scored. A fielder’s choice by J.T. Foster produced the final run in the inning. Rhodes went 2 for 2 for the Chargers. Walker and Zach Allen each collected two hits as well. Sells and Rhoton each had two hits for Franklin County. Bradley Garland, a transfer from Baylor and the nephew of East Hamilton baseball coach Steve Garland, slides safely into third with a third-inning triple against Franklin County on Saturday. Garland scores shortly after his three-bagger on a wild pitch.